The application deadline is January 15, 2016. You will need to complete the University of Illinois application through Apply-Yourself at http://www.grad.uiuc.edu/Admissions/instructions/. Baccalaureate degree from an accredited institution of higher education. The Graduate College requires a minimum grade-point average of 3.0 (A=4.0). Transcriptsfrom all institutions attended (follow ApplyYourself instructions). Results of the Graduate Record Examination. The Graduate Record Examination (GRE) is administered by the Educational Testing Service (ETS). The results must arrive at the University by the application deadline. Therefore, make sure that you make arrangements and take the test early enough. Use the Institution Code (1836) for the University of Illinois at Urbana-Champaign (do not use the department-specific code). The GRE must have been taken within five years of the date of application. For the MA-SLP program, a minimum of two letters of recommendation are required. For the AuD and PhD programs, three letters are required. Request letters of recommendation from faculty who are acquainted with your educational background and academic abilities. Letters from PhD faculty are strongly recommended. A personal statement. This statement is a very important part of your application. The statement should be approximately 500 words in length but a maximum of one page. In general the personal statement should explain why you are interested in the program. Certain points that could be addressed include: i) why you are interested in pursuing a graduate degree in the field, ii) what education and skills you expect to acquire through the degree, iii) how you expect to use your degree after graduation, and iv) PhD applicants should state their area of research interest and identify potential faculty mentors. To illustrate these points you may briefly describe any experience including volunteer time, paid work, internships, coursework, and pertinent training that have led you to apply. Applicants with professional work experience are encouraged to explain how they think their work experience has prepared them for graduate study at the University of Illinois. PhD applicants are encouraged to contact potential faculty mentors prior to submitting their application materials. International students must also submit scores for the Test of English as a Foreign Language (TOEFL) or the International English Language Testing System (IELTS). See For information on minimum score requirements for admission, see http://www.grad.illinois.edu/admissions/instructions/04c. Complete instructions for international students are contained in the on-line application. 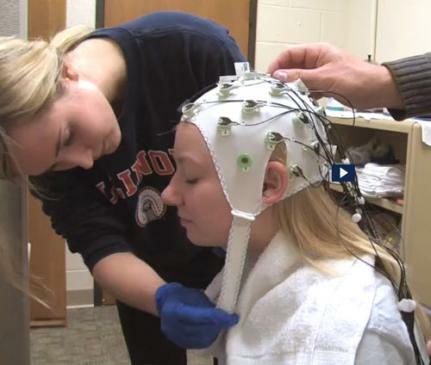 Students who are currently enrolled in the Graduate College of the University of Illinois at Urbana-Champaign and affiliated with the Department of Speech and Hearing Science apply to the Ph.D. program through an internal application process. The internal application will include transcripts, GRE scores, and previous letters of recommendation. New GRE scores will be required if they are more than five years old. The internal application must include a new personal statement and three letters of recommendation that address the student's preparation and potential for success in the Ph.D. program. These materials will be reviewed by the Graduate Admissions Committee and departmental faculty in the usual manner to determine acceptance of the internal applicant into the Ph.D. program. Financial support through the Department, typically research or teaching assistantships, is available for a limited number of students. Assistantships are awarded first to doctoral students and are based on merit and the strategic goals of the Department. For more information on financial aid, need-based financial support may be applied for through the University Financial Aid Office. Student Achievement Data can be found here.